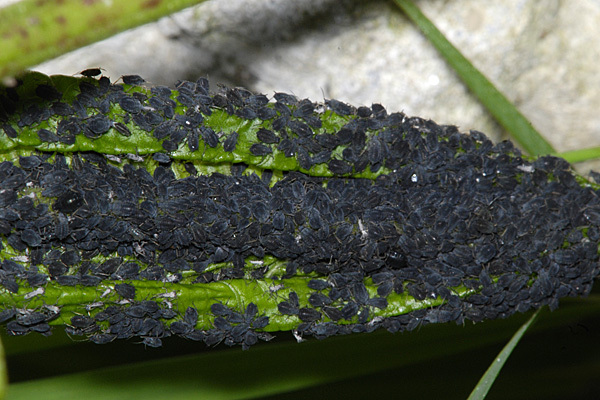 Aphis rumicis apterae are coal-black to very dark greenish-brown. Their antennae are pale near their bases but are darkened from the middle of segment III to their tips. The dorsum typically has well marked bands across tergites 6-8 as well as fragmented bands on tergites 1-5 (these bands are difficult to see in live specimens). The hairs on their hind legs are all much longer than the least width of the tibiae. The black siphunculi are 0.89-1.35 times the length of the black cauda. 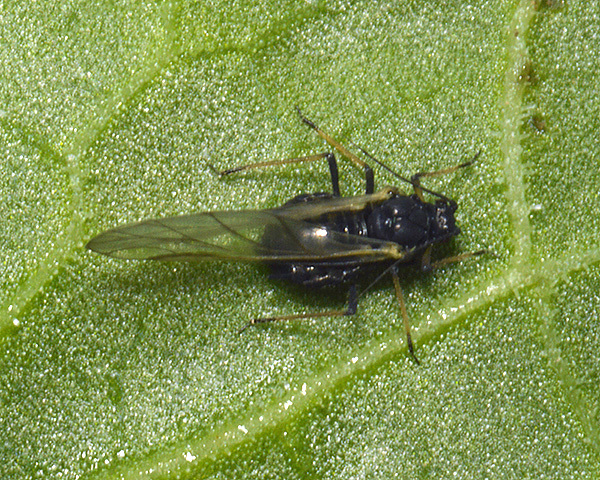 The body length of Aphis rumicis is 2.05-2.77 mm. 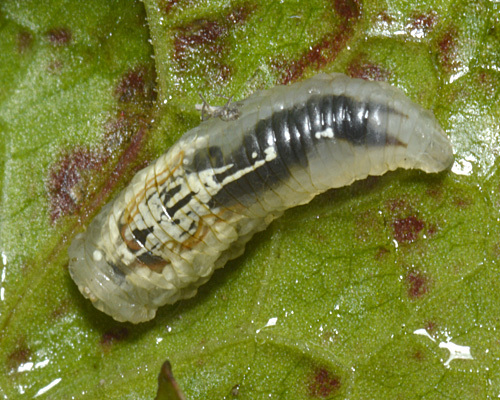 The alates normally have a very regular pattern of bands of even width on tergites 1-5 which often extend over most of the width of the tergites. 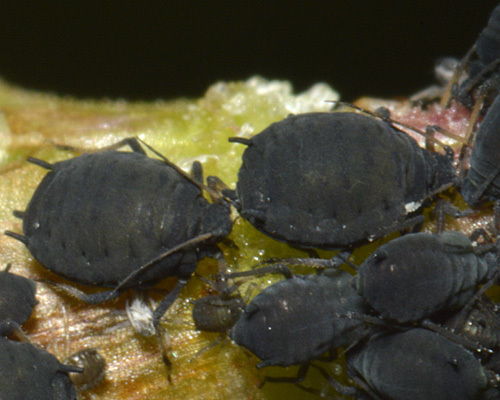 Immature Aphis rumicis do not have the pleural wax spots typical of many 'black' aphids. This last characteristic is one of the easiest ways to distinguish Aphis rumicis from Aphis fabae which also occurs on Rumex. 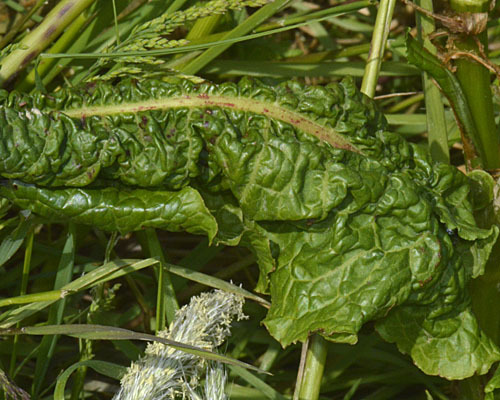 The dock aphid feeds on dock (Rumex species) and occasionally on rhubarb (Rheum). It does not host alternate. Sexual forms are produced in autumn. Aphis rumicis rolls and crumples the leaves of its host to form pseudogalls, before later in the year moving up stems and into the inflorescences (this also distinguishes Aphis rumicis from Aphis fabae which does not roll the leaves. 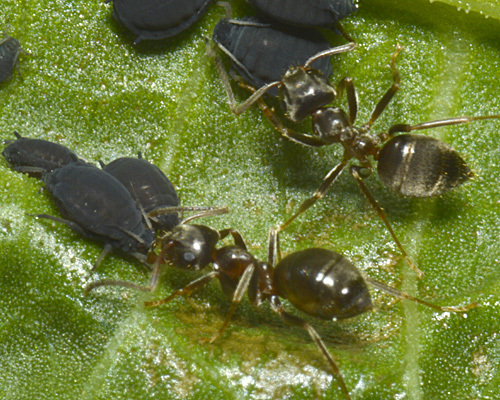 Aphis rumicis is usually attended by ants. Note: in the past Aphis rumicis was regularly confused with Aphis fabae and was consequently thought to also feed on beans and many other plants. 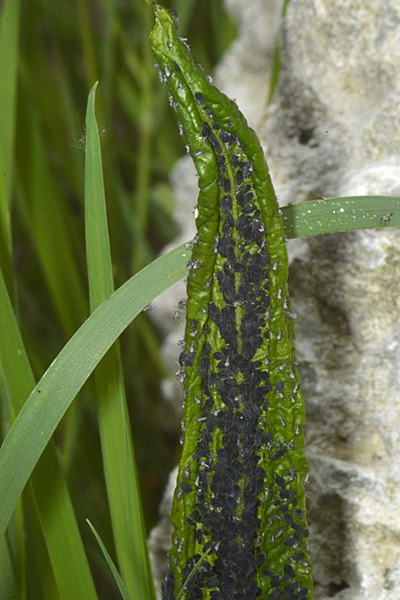 The longitudinally rolled and crumpled leaves of dock (see images below) are a sure sign of developing colonies of the dock aphid. Such colonies can be very large and contain many thousands of aphids. 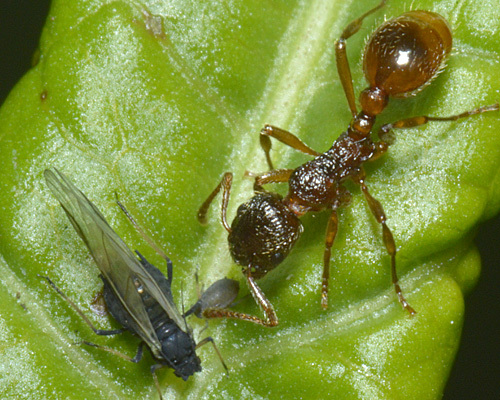 Aphis rumicis is nearly always attended by ants, whether by Lasius (see first picture below) or Myrmica ants (see second picture below). The presence of ants undoubtedly excludes some predators, but syrphid larvae like the one below still take heavy toll. Blackman & Eastop list 18 species of aphid as feeding on broad leaved dock (Rumex obtusifolius) worldwide, and provide formal identification keys. Of those aphid species, Baker (2015) lists 17 as occurring in Britain: Aphis fabae, Aphis fabae ssp. mordwilkoi, Aphis gossypii, Aphis nasturtii, Aphis rumicis, Aphis sambuci, Aphis solanella, Aphis viburni, Aulacorthum solani, Brachycaudus rumexicolens, Dysaphis radicola, Macrosiphum euphorbiae, Myzus ascalonicus, Myzus certus, Myzus ornatus, Myzus persicae and Neomyzus circumflexus. Blackman & Eastop list 28 species of aphid as feeding on curled dock (Rumex crispus) worldwide, and provide formal identification keys. Of those aphid species, Baker (2015) lists 22 as occurring in Britain: Aphis acetosae, Aphis craccivora, Aphis fabae, Aphis gossypii, Aphis nasturtii, Aphis rumicis, Aphis sambuci, Aphis solanella, Aphis spiraecola, Aulacorthum solani, Brachycaudus cardui, Brachycaudus helichrysi, Brachycaudus rumexicolens, Dysaphis radicola, Macrosiphum euphorbiae, Myzus antirrhinii, Myzus ascalonicus, Myzus cymbalariae, Myzus ornatus, Myzus persicae, Neomyzus circumflexus and Pemphigus populitransversus. Blackman & Eastop list 13 species of aphid as feeding on rhubarb (Rheum rhabarbarum) worldwide, and provide formal identification keys. Of those aphid species, Baker (2015) lists 12 as occurring in Britain: Aphis acetosae, Aphis craccivora, Aphis fabae, Aphis fabae ssp. mordvilkoi, Aphis gossypii, Aphis rumicis, Aphis solanella, Macrosiphum euphorbiae, Macrosiphum stellariae, Myzus ascalonicus, Myzus ornatus and Myzus persicae.